Kammy's Korner: A "New" Highchair for Caleb Jr.
A "New" Highchair for Caleb Jr.
One of the girl's that has gotten picked up on our Sunday School bus since she was a wee little girl recently had a baby. Her uncle happened to find this old highchair somewhere and asked her if she wanted it. She replied, "Sure, Kammy can do something with it". I groaned. Just a little. I tried to convince her that it was distressed and that look was "in". But she wanted nothing to do with the shabby look. Once I got going however.... it turned out to be a pretty fun project! First I just sanded it down good, then touched up all the black and painted over the gold. I was going to just refinish the wood parts, but there were some doozy stains and if I would have kept sanding, little junior would have been eating on a tray with the thickness of a toothpick. I had absolutely no plan in my mind, I just started painted and and as I painted, stuff came to my into my brain and yeah, that's how I usually work. Just start and let the juices flow as I work. I rarely start out with the picture of an end result in my noggin'. I added plaster of paris to my blue and light green paint because I wanted those areas to be super duper durable. If you've had kids, you know how hard they are on highchairs. What? A a spoon? It's for mashed peas? No it's not, it's for tray banging, Mommy! Yes, my letters are slightly off. Oops. I polyurathaned it (yes, that's a verb) and had junior's parents over for Sunday dinner to give it to them today, but I didn't send it home with them. I decided it needs another coat of poly. No telling how hard of a spoon drummer Junior is going to be. Giveaway going on this week until 8/20. 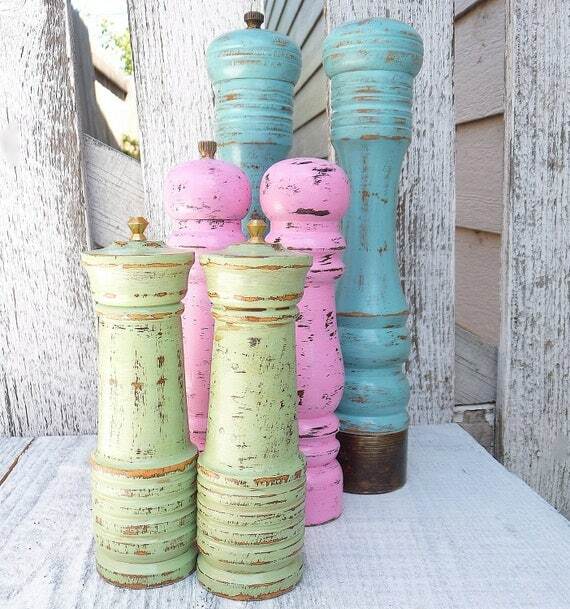 Click HERE for your chance to win a pair of Shabby Chic S&P Shakers from Huckleberry Vintage. Love how this turned out. 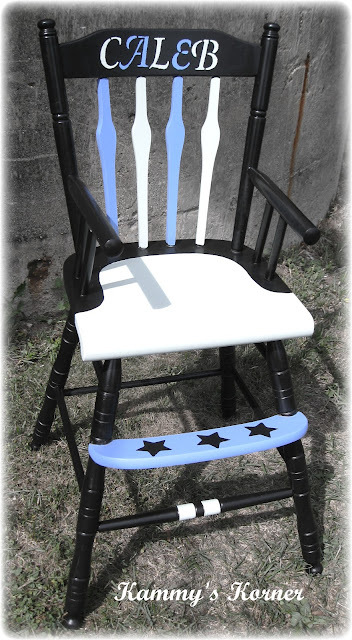 I love a good wood high chair, they have so much more character than the plastic ones of today! I have an old high chair like this too but have been nervous that it didn't have a safety strap between the legs but now that my little one is getting older, I can't wait to decorate it and start using it!!! Yours looks awesome! I saw your link on tatertots and jello, I knew I had to visit your blog, because the picture was so cute! I found a chair just like this one, except the colors are white and natural. Do you know the maker or age of it.